LASER - WHAT DOES IT TECHNICALLY MEAN? The term “radiation” is often misinterpreted because the term is also used to describe radioactive materials or ionizing radiation. The use of the word in this context, however, refers to an energy transfer. Energy moves from one location to another by conduction, convection, and radiation and cannot alter DNA structure. Basically, lasers cause localized damage to the hair by selectively heating dark target matter, melanin, in the area that causes hair growth, the follicle, while not heating the rest of the skin. ARE LASER MACHINES DIFFERENT FROM ONE ANOTHER? Yes. Different companies have different names for their lasers. The two main lasers that formerly dominated the scene were: Alexandrite (755) or the “Alex” & YAG (1064). But there is new technology that combines the advantages of both these technologies and eliminates their weaknesses (mainly pain while getting treated). It’s called the MedioStar Next Pro XL and is German-engineered, new on the market, and has done wonders so far. ALEX/YAG VS MEDIOSTAR NEXT PRO XL… WHAT’S THE DIFFERENCE? More effective laser (usually less treatments are needed). Hair grows in several phases (anagen, telogen, catagen) and a laser can only affect the currently active growing hair follicles (anagen). This is why several sessions are needed to kill hair in all phases of growth. The actual number of sessions depends on various parameters, including the area of the body being treated, skin color, coarseness of hair, reason for hirsutism, and gender. 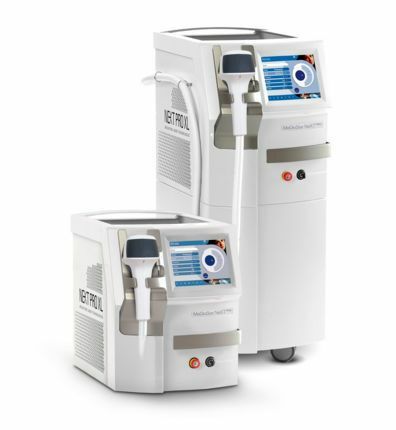 The discomfort associated with patients using Mediostar technology however, is absolutely minimal and almost negligent when compared to other laser hair removal technologies. LASER HAIR REMOVAL TECHNOLOGY - WHAT AREAS CAN BE TREATED? If it grows hair.. Then, yes it can be treated (as long as there isn’t any underlying contraindications). In other words, if you have any of these conditions or are taking any of the meds listed, you CANNOT be treated? No waxing, tweezing, or electrolysis for 4 weeks prior. If you have fair skin (skin types I -III), no sun exposure for at least 4 weeks. If you have darker skin (types IV – VI), no sun for 3-5 days. Prices can range anywhere from $100 per area per treatment to $900 per area per treatment (all depends on the size of the area and amount of hair). Yes, it can be costly, but let’s take into consideration the amount of money we all spend on razors, waxing, threading, plucking. There are several things you should keep in mind after you conduct your laser hair removal sessions. In fact, make sure to follow these strictly! Apply cool compresses to red or swollen area.